Kaart van Zuyd Holland met Aanwyzing der Overstrooming, door eys en Dykbraaken, in den Jaare 1726 omtrent de Maanden Jan:en Febr. A stunning map of Holland first drawn by Daniel de la Feuille in 1706. 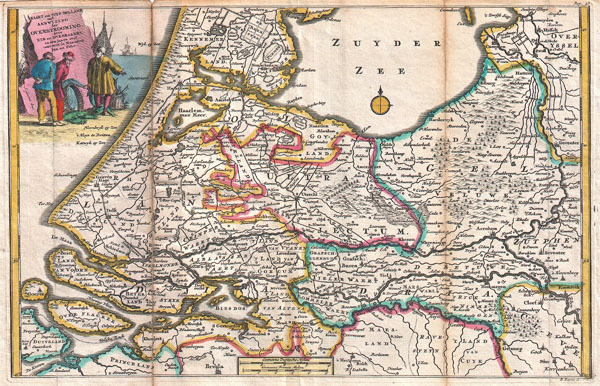 Depicts Holland south of Amsterdam focusing and the delta and course of the Rhine River. A title cartouche in the upper left quadrant drawn by J. Goeree features three fishermen discussing the day's catch. This is Paul de la Feuille's 1747 reissue of his father Daniel's 1706 map. Prepared for issue as plate no. 2 in J. Ratelband's 1747 Geographisch-Toneel.